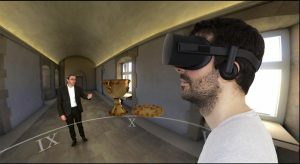 a spectacular 4K interactive application, a virtual reality program which showcases the future museum, which will open its doors in 2022. The various multimedia devices include 3D manipulations, zoom on works as well as 2D and 3D graphics animations. all devices are to be administrated by Wezit, allowing the management of the content as well as the languages. How will the Mueum of lorraine will look like ? Virtual and augmented reality !